I just finished creating my Santa Gnome Sequencing Clip Art. I used the clip art in this writing sequence worksheet. 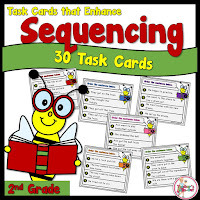 There are 2 worksheets included. 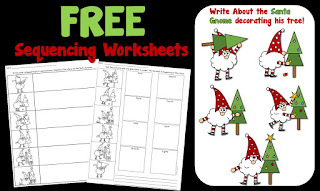 One is to write out the steps the gnome is doing and the other worksheet is to cut and paste the santa gnomes in order from beginning to end. They write only one or two sentences about what is happening in the 2nd worksheet. 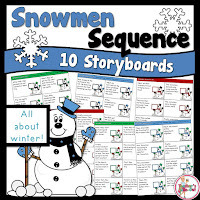 These are great for K-5th grade classrooms this holiday season. Click the picture on the left to download this freebie! 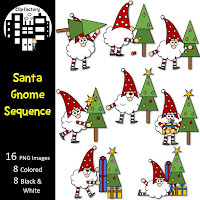 Here is the Santa Gnome Sequencing Clip Art. There are 8 images in color and black and white. Use this clipart in your classroom to sequence a story of events. Click the picture on the left to be taken to my clip art store, Clip Factory.